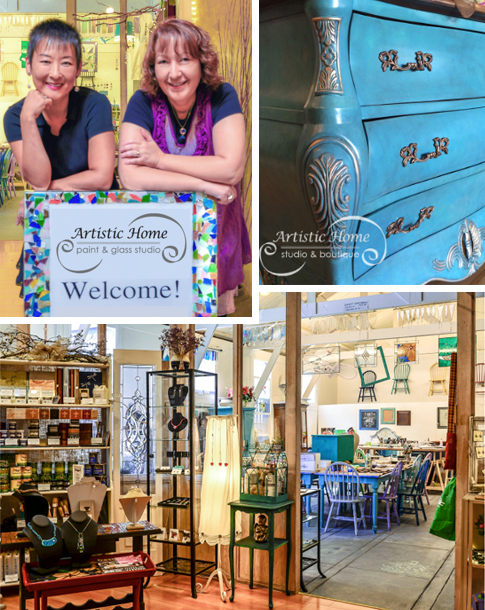 Artistic Home: Paint and Glass Studio located in the heart of Alameda is a creative combination of studio and boutique with a focus on home décor arts, teaching, selling supplies, and doing custom work for clients. With numerous 5-star rave reviews on Yelp, it has become the destination for home arts and décor enthusiasts and novices to explore their creativity. Classes are held in the stunning, light-filled, 1100 sq. ft. studio (formerly a historic barn), with its gabled and beamed 20ft high ceilings. Individual classes start as low as $30, while a 6- session course in stained glass is $275, supplies included. Two of the Bay Area's finest décor, art and craft professionals, JaYing Wang and Rachel Gingold started Artistic Home in 2013. Together with other instructors, they hold classes every day except Monday, for all ages, in: glass arts (fused glass, stained glass), mosaics, and decorative painting techniques for furniture and the home. They declare: "Our mission is to make the home more artistic."